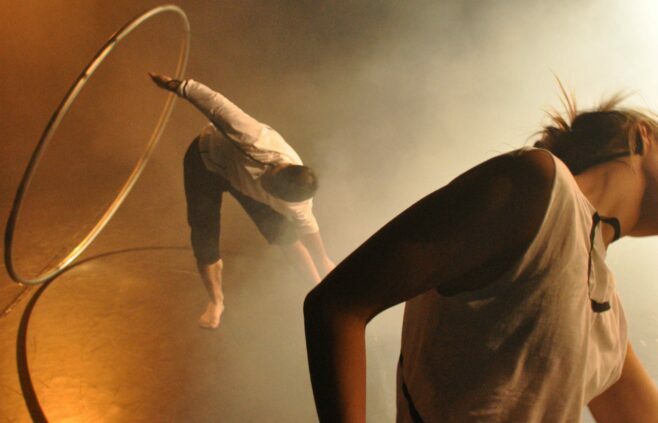 In Faux Pas, the symbiosis between the two art forms of contemporary dance and circus weaves delicate metaphors in a story about two people and the private invisible side of their relationship. The Cyr wheel becomes a platform for storytelling and the imagination. The trio of artists met to form Faux Pas. They were interested in creating a piece that would combine their experiences in contemporary dance and the discipline of Cyr wheel. Faux Pas has been quickly recognized in Latvia, receiving invitations to perform at several contemporary dance and circus festivals. With the support of Latvian Academy of Culture, State Culture Capital Foundation (SCCF), Riga City Council.